Home > Dining and Gourmet > Fast Food > KFC: Get FREE Delivery when You Pay with Masterpass! 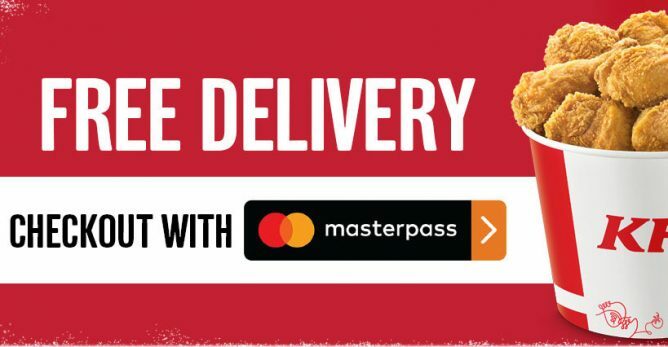 Till 25 Nov 2018 KFC: Get FREE Delivery when You Pay with Masterpass! Order KFC delivery from now till 25 November 2018 and pay with Masterpass to get free delivery (UP $4.00)! T&Cs apply. 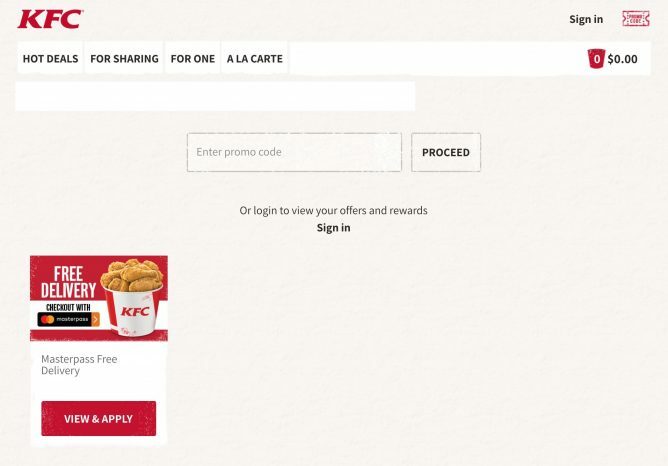 Promotion: Get FREE KFC Delivery when You Pay with Masterpass! - Valid till 25 Nov 2018, or while stocks last, limited to the first 4,200 redemptions. - Valid with payment via Masterpass only. - Delivery exclusive, excluding self-collect. - Not valid with other promo codes, offers and discounts. Just place your order online and click on Promo Code at top right corner to apply the promo! Previous: Cotton On: Online Exclusive Flash Sale with 30% OFF Selected Styles! Next: Ramen Champion: Enjoy 90 min of Unlimited Salmon Sushi with Shabu Shabu Meal!